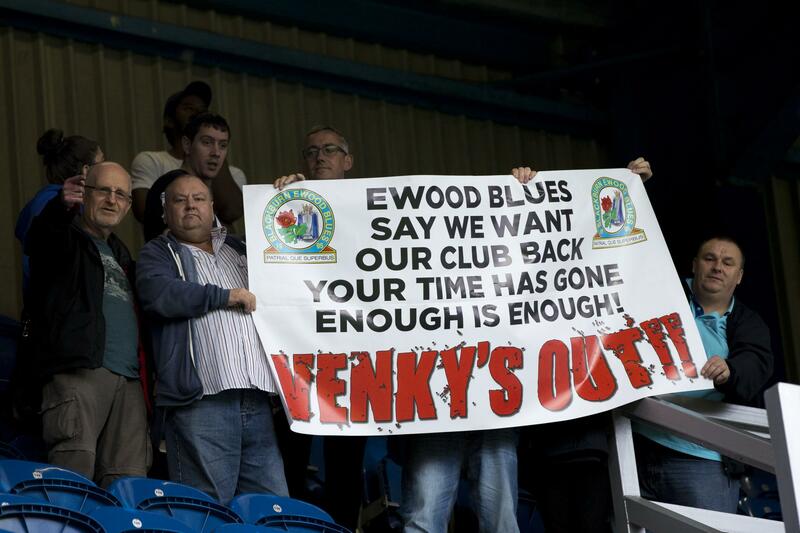 Disgruntled Blackburn Rovers fans are desperate for the club’s owners, Indian poultry firm VH Group – better known as Venky’s – to sell the club after a disastrous spell in charge during which the club has been relegated and and its players humiliated. Until now, any protests from fans have failed to make an impact in India, but when Blackburn Rovers play Manchester United in the FA Cup this weekend fans may have a chance to amplify their message beyond the shores of the UK to the Indian subcontinent – all with the aid of a helpful hashtag. It’s been a long time coming – Venky’s has owned the club since 2010 when Rovers was a well-run Premier League outfit. Initially the group had been looking to purchase a club in Pune, India, but full ownership of a Premier League team was seen as a shrewd move, tapping into a growing love of English Premier League football in India. A marketing video was quickly produced showing players tucking in to Venky’s chicken products with the slogan: “Good for you”. The advert – along with another club campaign #BirdysDate – was widely mocked, but it illustrated how the Indian chicken firm saw the club as a tool to push its products. And it was not long before the new owners started ruffling feathers both inside and outside Rovers. Soon after Venky’s took over Rovers’ manager, Sam Allardyce, was sacked while the club sat in a respectable 13th place in the Premier League. Star defenders Phil Jones and Chris Samba were sold to Manchester United and Russian club Anzhi Makhachkala respectively. An inexperienced manager from the backroom staff, Steve Kean, was then appointed and the club were eventually relegated in 2012. They have since struggled in the Championship with an embarrassing merry-go-round of managers, players and backroom staff and a reported £100m debt. Organisations such as the Rovers Trust have tried to take back control of the club and open a dialogue with Venky’s about the club’s future. The owners have essentially detached themselves from Rovers and halted any investment, putting the club into a state of managed decline. Fans responded by boycotting the recent FA Cup clash with Blackpool, a move which was labelled by The Independent as the most important fan protest in years. Some fans have even started a kickstarter campaign to raise money to pay for a “Venky’s Out” advertisement in an Indian newspaper. Rovers won the game against Blackpool and have now drawn Manchester United at home. 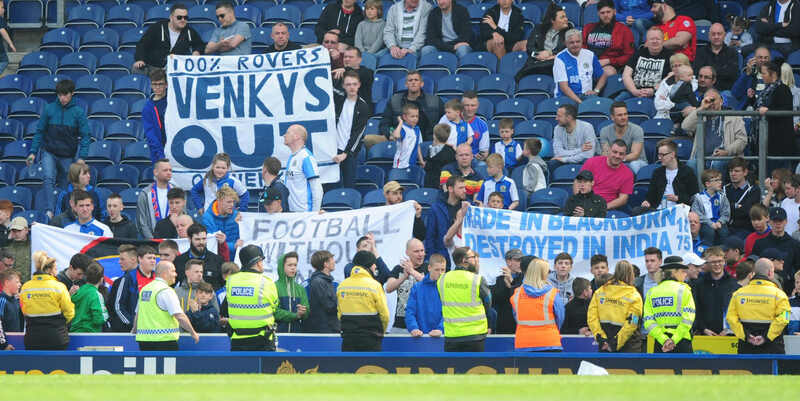 On the field, a weakened Rovers side will be underdogs – but off the field, the match might present an opportunity for fans to make a noise using the #VenkysOut Twitter hashtag. 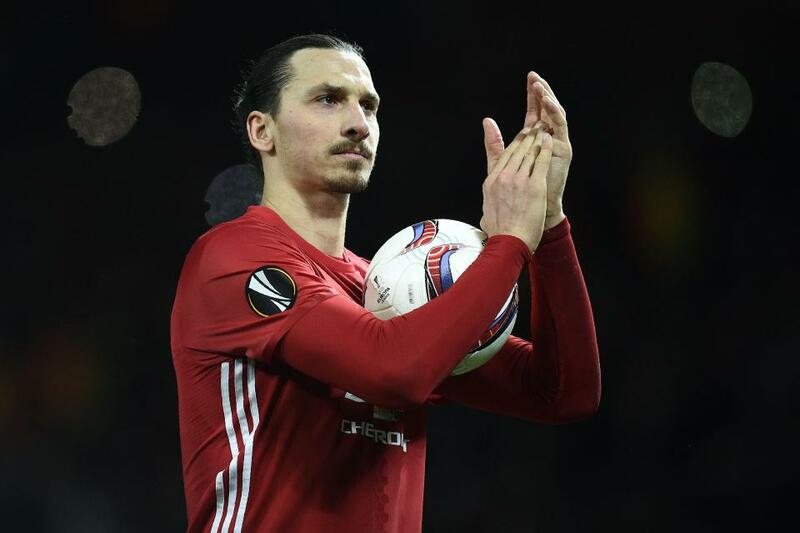 Between them Manchester United stars Paul Pogba and Zlatan Ibrahimović have more than 7m followers on Twitter alone and overall, United has more than 10m Twitter followers and 72m likes on their official Facebook page. The prediction of the rise of football and Premier League in India was correct. Kantar’s 2012 study of Manchester United fans for example, was the largest-ever football survey and it showed that United had 659m followers, half of whom were in Asia. This massive fan base of Indian Manchester United and Premier League followers was the audience that Venky’s sought to tap into – but without Premier League status and stars, the Rovers / Venky’s brand is practically invisible in India, failing to give Venky’s brand the boost the owners had coveted. Social media algorithms work in such a way that conversation around a brand leads to more visibility on people’s timelines. In effect, that means that Manchester United fans in India will discuss their team and their timelines will accordingly offer them more United content. Any Blackburn Rovers stories or content are rendered invisible by the social media platforms used extensively by Indian fans. A big club such as Manchester United with a huge fan base in India generates a lot of discussion on social media platforms. By contrast, Blackburn Rovers is relatively invisible on social media in India. But the #VenkysOut campaign has an increased chance of reaching India via the social media feeds of United fans in India. 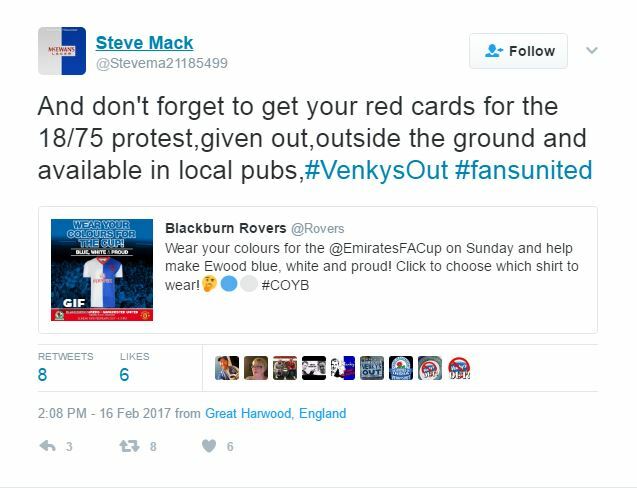 The #VenkysOut “18/75” campaign is urging fans not to take to their seats until the 18th minute and to leave the stadium on the 75th minute. Supporters are also planning on holding up red cards during the match or download a special red card app. The aim is to get Venky’s to cut their losses and sell the club. Social media is massive in India and has a history of galvanising and amplifying fan protest. The Manchester United FA Cup game is the biggest chance in years to make a statement that could reach millions of international fans sitting on the end of smart phones and social media. The impact will remain to be seen but there is at least a glimmer of positivity and hope for Rovers fans.